The Trump administration is keen on strengthening partnership with India to counter growing Chinese aggression in the region. President Donald Trump met Prime Minister Narendra Modi on Monday, November 13, on the sidelines of the ASEAN summit in Manila. All eyes were set on the meeting as both the leaders discuss a host of key issues ranging from strengthening bilateral cooperation to the security of Asia-Pacific region. Trump and Modi had also met on Sunday during a brief meeting on the sidelines of a dinner to mark the 50th Anniversary of ASEAN. And the Monday meeting was their second face-to-face interaction since Modi visited the US in August this year. According to media reports, Trump met Modi in Manila to review and strengthen the bilateral relationship and to draft policies to build upon the South-Asia strategy. Initiatives to improve connectivity in Asia Pacific region, as discussed by Secretary of State Rex Tillerson during his recent visit to India, may also have been discussed by the leaders. Trump, on Friday, had praised India for achieving astounding growth and hailed Modi for bringing together the people of India. The Trump administration is keen on strengthening partnership with India to counter growing Chinese aggression in the region. This includes improving connectivity in the region as well as increasing manufacturing activities. Washington is considering India as a strategic partner and expects India to play a vital role in ensuring a rules-based order in the region according to the Afghan strategy unveiled by the Trump administration. Apart from countering China, the US is concerned about the $29.6 billion trade deficit with India. 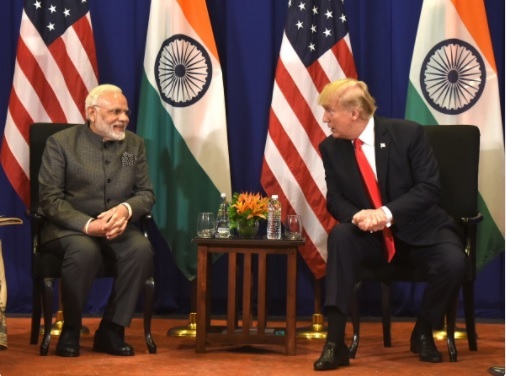 During recently concluded US-India bilateral Trade Policy Forum (TPF), Washington had pushed India to take strong measures to open up its economy furthermore in order to facilitate more bilateral trade. The US expects India to take action to remove several trade barriers including non-science-based barriers to agricultural trade, continuing and new regulatory and technical barriers to trade that impact sale of US high technology and other products, tariffs in a number of agricultural and industrial sectors. Modi also met Japanese Prime Minister Shinzo Abe, Russian Prime Minister Dmitry Medvedev and Malaysian Prime Minister Najib Razak on Sunday. “They agreed that a free, open, prosperous and inclusive Indo-Pacific region serves the long-term interests of all countries in the region and of the world at large. The officials also exchanged views on addressing common challenges of terrorism and proliferation linkages impacting the region as well as on enhancing connectivity,” said an external affairs ministry spokesperson about the quadrilateral meet yesterday.